I hope you have enjoyed looking at my website. I work mainly in watercolour and oil so virtually all the paintings here are either one or the other although I am starting to dabble in acrylic and mixed media which is pushing my work into new and interesting places. If you are interested in any particular painting please email bek@barbaraking.co.uk or telephone 07798 918470 and I will provide details of size, medium, structure used and any other information you would like to know about it. 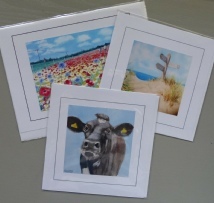 I also produce greetings cards of my paintings at £2 each (plus postage) so if you see any images you would like to have as cards please email me and I will arrange to send them to you (payment via paypal - invoice raised after receiving order). If you have any other queries or would like to arrange a studio visit (I live in west Norfolk), please do not hesitate to get in touch. Friday 26th April to Sunday 28th April. 2019 10am to 5pm. On the weekend after Easter I am staging a 3 day exhibition of my landscape paintings in my local village hall featuring the coast and countryside of Norfolk stretching from King's Lynn to Cromer. Beach scenes at Hunstanton and Holme, the creeks and harbours of Thornham and Brancaster Staithe will sit beside large open skies over Burnham Deepdale and resplendent sunsets tinting roads and salt marshes with pink, peach and purple hues. The undulating countryside with its tree lined lanes, rich and colourful fields and far reaching views will complete the picture of this glorious county.